To my fellow graphic novel lovers and newbies alike, take a look! This post is the tip-of-the-iceberg of graphic novels written and/or illustrated by women. Most are newish titles that have recently made their way into my personal library. I thought I’d start by making a list of my favorites and then go more in depth in a future post. Who doesn’t love Faith Erin Hicks? (I’m serious, who doesn’t?). Hicks has a distinct drawing style which makes her work automatically recognizable. Her works are usually funny with serious undertones and never disappoint. Nimona started off as a web comic while Noelle Stevenson was a student at the Maryland Institute College of Art. It was so popular that it was published as a hard-copy and the full comic is no longer available to read online. “Nemeses! Dragons! Science! Symbolism! All these and more await in this brilliantly subversive, sharply irreverent epic from Noelle Stevenson. Featuring an exclusive epilogue not seen in the web comic, along with bonus conceptual sketches and revised pages throughout, this gorgeous full-color graphic novel has been hailed by critics and fans alike as the arrival of a “superstar” talent" (From Publisher). Also by Noelle Stevenson: The Lumberjanes series which is both hilarious and full of adventure. There is also some cute references to popular culture within characters dialogue. 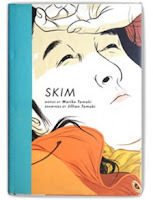 Jillian and Mariko Tamaki are cousins and regularly collaborate on works (Jillian being the illustrator part of this duo and Mariko the writer). This One Summer follows two girls on their annual summer holiday destination. One girl is experiencing the usual holiday fun while the other is dealing with their parent’s separation. The blurb: “Every summer, Rose goes with her mom and dad to a lake house in Awago Beach. It's their getaway, their refuge. Rosie's friend Windy is always there, too, like the little sister she never had. But this summer is different. Rose's mom and dad won't stop fighting, and when Rose and Windy seek a distraction from the drama, they find themselves with a whole new set of problems. One of the local teens - just a couple of years older than Rose and Windy - is caught up in something bad... Something life threatening” (From Publisher). Illustrator Jen Wang and fiction author Cory Doctorow collaborate on In Real Life, which follows Anda’s love of video games. Wang's illustrations are absolutely gorgeous and are definitely worth checking out. Here’s some more info: “Anda loves Coarsegold Online, the massively-multiplayer role playing game that she spends most of her free time on. It's a place where she can be a leader, a fighter, a hero. It's a place where she can meet people from all over the world, and make friends. Gaming is, for Anda, entirely a good thing” (From Publisher). Anya's Ghost captures typical themes of teen angst: discovering her real self, embarrassed of her parents (who isn’t, amiright?) and crushing on someone at school. “Anya could really use a friend. But her new BFF isn't kidding about the "forever" part . . . Of all the things Anya expected to find at the bottom of an old well, a new friend was not one of them. Especially not a new friend who's been dead for a century” (From Publisher). 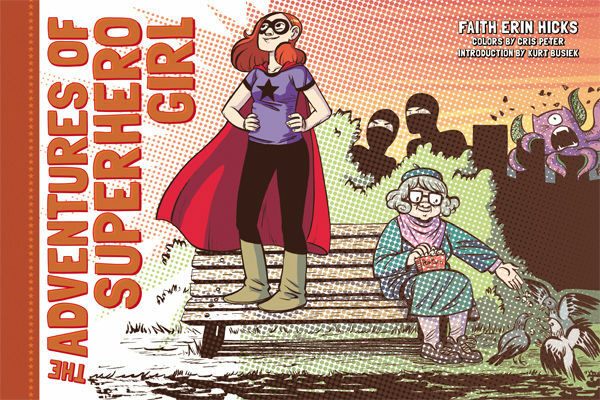 This is Victoria Jamieson’s first graphic novel. It’s a coming of age story where Astrid realizes she has different interests than her current friends. 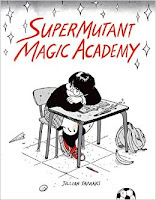 This book has themes of self-discovery and confidence, not to mention those nostalgic memories of starting Jr. High again (sigh..). The blurb: “For most of her twelve years, Astrid has done everything with her best friend Nicole. But after Astrid falls in love with roller derby and signs up for derby camp, Nicole decides to go to dance camp instead. And so begins the most difficult summer of Astrid's life as she struggles to keep up with the older girls at camp, hang on to the friend she feels slipping away, and cautiously embark on a new friendship” (From Publisher).